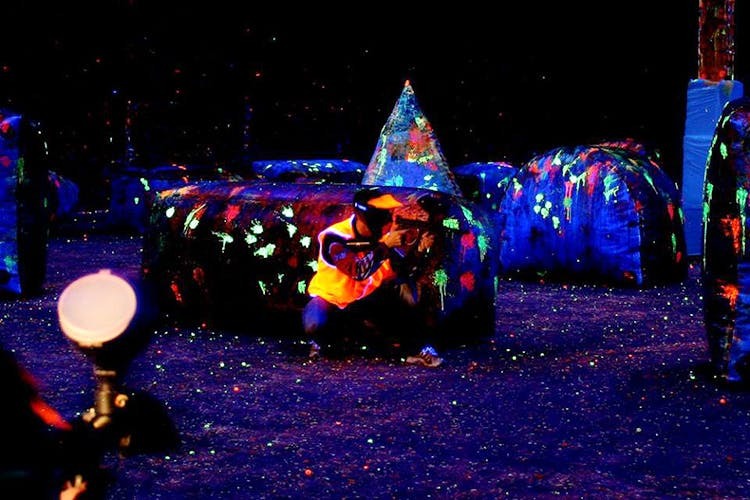 Neon Factory has no time limit on how long you can play paintball in their arena. Gather the squad and strategise a day of shooting people, because extra pellets start at an easy INR 100. The best part about the arena is that you’ve all the time in the world to plan, strategise and take down your enemies (we mean friends) one by one. You only need to keep an eye on your limited count of pellets, if you don’t want to pay for extra rounds. But that extra rounds aren't expensive too as the standard price per person in at INR 250 for 40 pellets with reloading options at INR 100 for 20 pellets, INR 200 for 50 pellets, and INR 300 for 100 pellets. The arena is filled with all sorts of obstacles that double up as cover, they’ve got a neon graffiti paint job going all over the place that gives it a very street, edgy look. You could sort of tell that it’s got a very Marc Eckō’s Getting Up: Contents Under Pressure video game location vibes. Paintball guns, pellets, proper gear that’s inclusive of camo-suit, and headgear,, you’ve got yourself an area to unleash hell and fury (playfully, of course). The arena used to be a glow in the dark arena with players having to play under UV light. Due to visibility issues, the arena now uses natural light, so the photos you see are before these changes. Glow in the dark would have been amazing! Since the location can be far for many, we suggest to plan your day and head here. If you are planning to make a weekend getaway out of it, check out these resorts on Kanakapura Road.